59, Jalan PSK 10, Pusat Perdagangan Seri Kembangan, 43300 Seri Kembangan, Selangor, Malaysia. 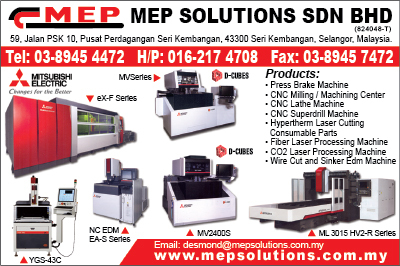 MEP Solutions Sdn Bhd was incorporated is years 2008. We are representing Mainly Mitsubishi Electric products for EDM machines and Co2 laser processing machine and others CNC machine as well. We are always prepared to serve our customer with quality of machine and satisfaction of after sales service. As one of the market leader in the EDM machine and Laser cutting machine, we are always in innovation in promoting our products in the market. Our mission is to keep continues upgrade ourselves to meet the challenging market and enhance our customer satisfaction through products and service. On the others hand, we try to bring more benefits to our customer for the expectation.